The base model of the Qashqai has a manual transmission in Canada, while the U.S. market only gets the continuously variable unit. TORONTO — Nissan Canada President Joni Paiva now reports directly to Jose Munoz, chairman of Nissan North America, after Christian Meunier, former chairman of Nissan Canada, recently became global vice president for Infiniti. The new role for Paiva came amid a host of changes to Nissan’s North American leadership team in October. Previously, Paiva reported to Meunier. No doubt Paiva and Munoz will have plenty to talk about. Nissan is set to roll out 2018-model- year redesigns for its Versa, Sentra and Altima models, in addition to a redesign of the Infiniti QX50 and the Canadian launch of the redesigned Nissan Leaf electric vehicle. The year could also prove crucial as Nissan attempts to position itself for a future that’s likely to be dominated by electric and autonomous vehicles, as automakers attempt to outdo each other on connectivity technology and as governments quickly raise emissions standards. What follows is a transcript of an interview Automotive News Canada’s John Irwin conducted with Paiva. My responsibilities remain the same. They have not changed. The operations should be no different due to this organizational move. Christian coming in was instrumental in the huge success of Nissan in Canada. So we wanted to ensure that we had continuity, when you have all these dealers with you and investing with you because you commit to things. And having Christian as chairman for Canada was a very good way to show our dealers the continuity of the business and our strategy. In that role, Christian would ensure the continuity of the strategy, making sure that we wouldn’t go a complete opposite way, and [would] maintain the momentum. And personally, he was a very good mentor for me. Sometimes you feel a bit alone when you run the company, and having Christian as a sounding board was very good for me. Christian, he has a new global role for Infiniti and obviously we are going to stay closely in touch for Infiniti in Canada, from a profes- sional point of view. And of course we know each other pretty well and have direct communication and contact. And from a personal point of view, I have a huge respect for Christian. I’m French. I am European. I am used to seeing many, many countries in a small perimeter. In Canada, you need to have a surgical approach. The country is huge, the second largest in the world. But the market is completely different from Vancouver to St. John’s [Newfoundland]. I think my European and French experience helped me to read the market, the market’s needs, adjust, adapt. I think the fact that I speak French helps a lot with Quebec relations. My key role is to represent Canada. Canada is the sixth in size for Nissan. It’s a big mar-ket that matters. 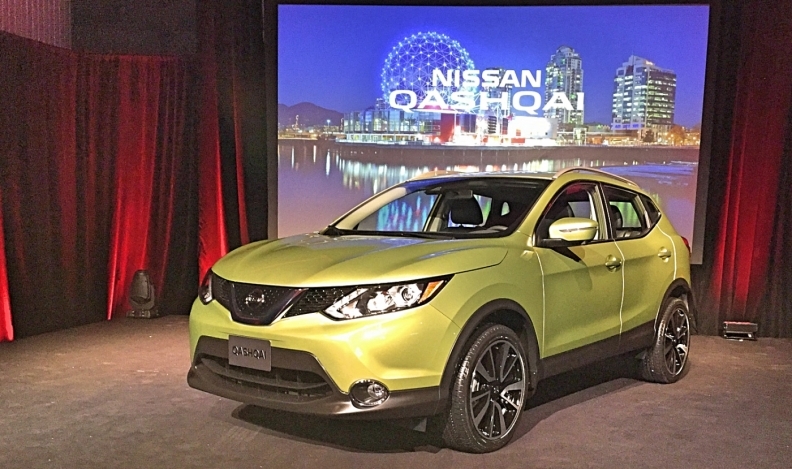 Nissan globally listens to the Canadian market. For instance, in Canada, we have Qashqai with a manual transmission. That’s something if you cross the border south they don’t have it. We know that Quebec drivers really like manual stick shift. Another one is standard heated seats or standard [heat- ed] steering wheels on vehicles you would not necessarily have those features standard, or remote engine start. We started our new program to presale the new Leaf. We are extremely pleased with the feed- back we’re getting, the hand raisers and the firm orders we’re getting already from our dealers. We are going to sell more electric vehicles. And we have to play by the rules. Either you fight the change or you go through and you lead. Our intention is to keep the leadership. Today, the biggest markets are Quebec, the second biggest market is B.C. and we’re starting to see Ontario ramp up. Fifty per cent of our sales roughly happen in Quebec, but that ratio is trending down as other provinces ramp up [with EVs]. At the beginning we had customers buying it more as a second vehicle. Once they bought it, they realized that they could use it every day and the conventional vehicle became the second one that they would use on weekends or if they wanted to go across Canada. I don’t know many people who go across Canada every weekend, though. The trend is for it to be more and more as the first car in the household, especially now with a 40 per cent increased range.